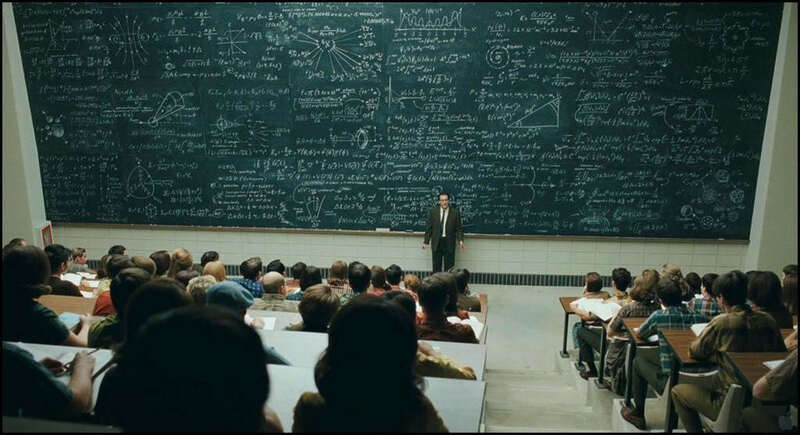 Why does Science have so many equations? There's a problem we have to face in our bid to recruit people to Science, particularly Physics. 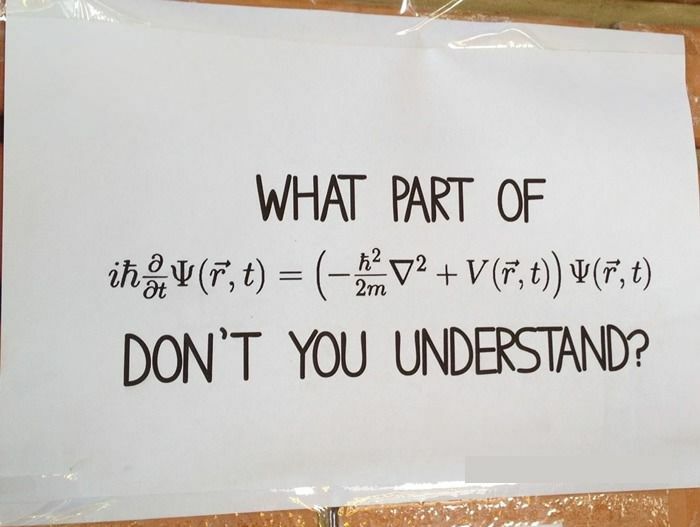 It's so equation-heavy that many people get put off. Understandably so. If you've never come across equations like the one above, they can seem daunting. This particular equation is a form of Schrodinger's wave-equation which tells us the probability of finding a particle in a certain place at a certain time. So why not just say that? Why do we need all those crazy symbols? Science is about trying to understand the Universe. And when you start reading technical books you quickly find yourself up to the neck in formulae and mathematical trickery. Is this because nature is somehow mathematical and we humans have to play ball? I don't think so. If you read some of the great Scientific texts of history, you'll find they're surprisingly light on equations. Even Isaac Newton's Principia Mathematica, the book which introduces calculus, the law of gravitation and the laws of motion, is very, very wordy. He tends to describe everything in serpentine sentences with only the occasional diagram. This is one of the reasons we use math. Mathematical notation is an elegant way of writing something which would take ages to say in ordinary words. I've debated with mathematician friends about whether nature is mathematical and at the moment I'm pretty sure it is not. Nature follows behaviours which we can measure and predict with mathematics, but that's all we're doing. Nature doesn't know about the equations we use to describe her. In the same way a mountain isn't aware that humans call it "a mountain". It's just busy being what it is. Mathematics is a wonderful language we use to keep tabs on the Universe efficiently and cleverly and it is very useful for Science. It's vital to experiments and helps us discover new ideas. But nature's behaviour can often be explained without using equations and a lot of the time it should be. As a Science teacher that's what I spend a lot of my time doing, particularly in Physics. Imagine if I just rocked into the classroom and wrote a bunch of equations on the board without explaining why they were true. I'd cover the entire A level syllabus in a single lesson but none of my students would understand anything. We have to know what the equations are describing, not just how to punch them into our calculators. But this still leaves the question: if nature is not mathematical, why is mathematics so useful when dealing with it? I think there are four straightforward answers and one weird fifth one. 1) Mathematics keeps track of things too extreme for our brains. Consider a hydrogen atom (the most common type in the Universe) it’s about 50 billionths of a meter across and your body contains roughly 470 septillion of them. There are less grains of sand on the entire planet than there are hydrogen atoms in your body. Just think about that. Even the most things you’ve seen in one place (grains of sand on a beach) still falls woefully short of helping you visualise the scale of atoms. But in mathematical notation we just write 5 x 10^-12 meters and 4.7 x 10^27 atoms. The pencil and paper take it without complaining. We don’t have to visualise the numbers in order to write them down. 2) Mathematics keeps track of things with too many leaps for our brains. Take the word unhappy. The “un” part tells you to make the other part negative. Unhappy means the negative version of happy...sad. If a person says “I’m not unhappy”. We have two negatives to consider: not and un. We can mentally work out what it means: the opposite of anti-happy. In other words, the person is saying they’re happy. But suppose someone says “It’s not true I ain’t not unhappy.” At this point most people apply a simple mathematical rule without realising. Count the number of negatives and if it’s an even number they cancel. In this sentence there are 4 negatives (not, ain’t, not, un) so the final result is that the person is happy. It becomes much easier to apply a simple rule than flip our heads back and forth. This is where maths is simpler than words. Or suppose I wanted to describe how far away a car is. Let’s say it is x meters away. At this point it's easier just to say the actual number of meters e.g. 5 meters. But what if the car starts moving? This means x is different at different points in time. Now we have to talk about how x is changing as time passes. Still not too complicated because all we’re talking about is velocity i.e. what position is (x) at different points in time (t). Now let’s say the car doesn’t move away at a single velocity, let's say it gets faster. What we call acceleration. This is how velocity is changing compared to time. Or to say it in full: acceleration is the rate of change of (how x changes compared to t). Now let’s say the car’s acceleration is getting less. That doesn’t mean the car is slowing down (it’s still accelerating) but it started off with a big acceleration and then adopts a small acceleration. The rate at which its speed increases is decreasing. This starts to get hard to picture. Now imagine the rate at which the object is getting less accelerated is increasing. I’ve lost track of what the sentence even means by this point. Our brains are built to take a very basic world involving simple behaviours: staying still, moving, speeding up and slowing down. But nature doesn’t limit herself to such a boring set of operations. We might need to work out “the rate of change of the rate of change of the rate of change of the rate of change of the rate of change of (the rate of change of [the object’s position x compared to time t])”. ​ Even if you don’t know what those symbols are saying, you can definitely see it’s easier, quicker and neater to write this equation than the bulky sentence I had before. If we use equations like these we can sum up a multi-part idea, do a calculation and generate a useful answer without having to visualise what’s going on at every point. Once again the paper and pencil have done the work for us. "If you want to make an object change its behaviour by a certain degree you will need to interact with it. The size of the interaction will determine how much of a change you manage to carry out on the object. You can calculate the size of the interaction by taking the rate at which you make the object's speed or direction change and then apply this to every bit of the object, since every bit of the object will act as one whole. Once you have calculated the magnitude of changing every bit of the object you will have the magnitude of the interaction required." Or we could just write F = m x a which says the same thing, but neater and quicker. The pencil and paper do the hard work for us. 4) Mathematics lets us keep track of comparisons. Describing nature is all about saying what something is doing compared to, or in terms of, something else. It could be how many of a certain species there are (comparing a creature to a scale of numbers), how a rocket moves through space (comparing position to time) or how much heat a chemical reaction gives out (comparing types of substance to heat) or whatever we want. Science is always describing one thing in relation to something else. And mathematics has a wonderful system for comparing one thing to something else: the equals sign “=”. Invented by Robert Recorde in 1557 this deceptively simple trick allows us to start solving puzzles with mathematics because it relates one set of ideas to another directly. For instance, take Ohm's law: I = V/R (the amount of electricity flowing through a wire can be expressed as the energy of the electrons, distributed among the vibrations of atoms in the wire). Not only does mathematics allow us to describe things neatly, it lets us describe things in terms of other things. This also helps us make predictions. If we want this much I and are faced with this much R, we can predict how much V we’re going to need and so on. This means we can do experiments to test hypotheses about what's really happening in the wire. 5) Mathematics lets us keep track of things too weird for our brains. The four examples I've given so far are about making life easier. At the turn of the century however, we found ourselves needing mathematics for something even more peculiar because nature seems to spend most of her time doing things we can’t actually visualise. Consider electrons. The angular momentum of an electron is a measure of how energetically it's spinning around an axis...even though electrons don't actually rotate about an axis The electron is somehow spinning without actually having anything to spin around. What does this even mean? To say an electron can have a spin trapped inside it when it is not rotating doesn't make sense. We might start with an experiment (A) and get surprising results (B). We can easily describe how we set the experiment up and what we found, but there’s no common sense way of getting from A to B. We can’t actually visualise what happened since there’s no arrow going directly from cause to effect. The Universe seems to be doing something un-imaginable, so let’s invent a symbol to represent “the Universe doing something we can’t imagine”: Ø. We can come up with equations to get us from A to Ø and if we follow these equations through, they take us from Ø to B. Our brains haven’t given us a way of imagining the Ø process, but it matches reality so there’s a good chance the equations are describing something close to what’s happening. Again, the pencil and paper have no idea we’ve cheated. We just follow the rules of maths and describe an unimaginable universe, which just happens to be our own. I don't love mathematics and it isn't my passion. I'm interested in how the world works though, and maths is often the best way to find out. I'm very much of the opinion that if you can't translate an equation into either words or an experimental result, it is meaningless...but that doesn't mean we should stop researching mathematics for the sake of it. There was a time when even negative numbers were considered "abstract theoretical maths" until we found uses for them in the real world. When I started studying Science I decided to become mathematically literate because it helped with my end-goal, understanding nature. The problem is that learning mathematics takes years and all the necessary practice can seem fruitless. It’s a bit like learning a language. The process of acquiring it can seem repetetive, even frustrating at times. But once we’ve mastered it we can read whole books that would otherwise be hidden to us. We just need to remember that the maths isn't the meaning and the equation isn't the reality.